Andrea Harrington grew up in a bilingual Montreal family and attended primary school in French and high school in English. She moved to Toronto as a young adult and quickly discovered that it’s a far more interesting city than Montrealers give it credit for. She still travels back to her hometown often enough to know the VIA Rail schedule by heart. Andrea studied political science at Trent and York University and law at the University of Toronto. She has taught political science and international development at York, Western, and Trent universities and has helped thousands of students with law and graduate school admissions. Andrea’s experience growing up in a multilingual and multicultural environment inspired a lifelong interest in foreign languages and cultures. While completing her studies, she spent five summers in Moscow learning Russian and supervising a Canadian summer study program, and a year coordinating an HIV/AIDS professional development project in Toronto and New Delhi. She has a strong commitment to community service and volunteers her translation, writing, and legal research skills to a number of organizations. 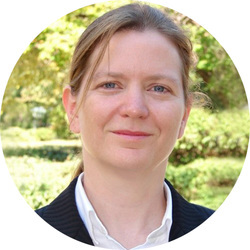 Andrea's translation work focuses primarily on law, international development, corporate communications, and academic texts. Her most demanding client is her three-year-old nephew, who frequently requests simultaneous interpretations of Au clair de la lune and complains if it doesn't rhyme.